NBC has decided to join in the bashing of Christians by airing a special by the Antichrist's Madonna sometime in November. In the show, Madonna, wearing a fake crown of thorns, descends on a suspended mirrored, disco ball-type cross. Kevin Reilly, an executive at NBC, said Madonna considered the scene mocking the crucifixion of Christ the highlight of her show. "We (NBC) viewed it and didn't see it as being inappropriate. " 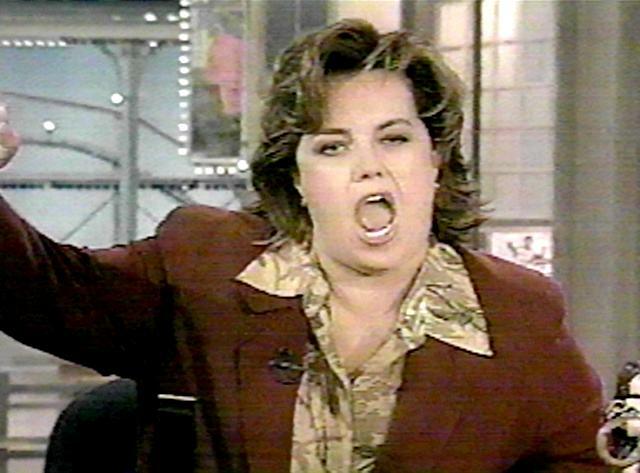 Last week Rosie O’Donnell raised ire and drew fire when she boldly asserted that "radical Christianity" is "just as threatening as radical Islam in a country like America where we have separation of church and state." PETE TOWNSHEND was so disgusted by the trappings of Christianity after watching 2004 MEL GIBSON movie THE PASSION OF THE CHRIST, he wrote an angry track lambasting "drag queen" priests. The legendary rocker expresses his bemusement in A MAN IN A PURPLE DRESS on THE WHO's new album ENDLESS WIRE, and insists faith has nothing to do with dressing up. He says, "It is the idea that men need to dress up in order to represent God. I'd just go ahead and do it. I wouldn't dress up like a drag queen." If I could rub a magic lamp and could make a wish, I would wish that all celebrities would shut up especially when they are talking about subjects that they know nothing about. It is obvious that Madonna, Rosie, Pete and the good folks at NBC do not have a clue about Christianity. Why isn’t Madonna doing her song and dance act while swinging from a Islamic Crescent? Do you think NBC would air that on prime time? Why isn’t Rosie talking about the radical Christians such those that work for The Salvation Army or World Vision or perhaps those dastardly folks at Bread for the World, Lutheran Relief or Samaritan’s Purse. Pete has been bashing guitars for years and now he is bashing Christians. Perhaps he could take his anger regarding the sartorial aspects of the first century clergy and devote it speaking out against the dirty night-shirts, AK-47’s and head wraps that seem to be the fashion rage in the Middle East. Christians take this abuse because Jesus said to turn the other cheek. But they do not realize that from a historical standpoint this was pointing out that He was not a slave or enslaved to Rome. So the more radical among us Christians may object from time to time, but mostly we vent our anger by doing good deeds, blessing those that curse us and binding up the wounds of our enemies.